S.p.A., the ship includes some of the most sophisticated technical and envi- ronmental advances of any ship afloat. Many advances are below deck, well outside of the view of the passengers. Alaska. Helping the Oosterdam to have a zero impact on the environment is the ship's Rochem system of sewage treat- ment. a purification system that treats all the water used on the ship. The gray water, which comes from showers and sinks and laundry water, is recycled and used for various technical things on the ship such as cooling water. Another part of the Rochem system treats the sewage, or black water and galley drain water. Vista Class ship. With these two purifi- cation systems provide a treatment capacity of 850 m3/day (224,400 gal- lons/day) for the 85,000-ton vessel. E-mail sales@ultrapoly.com installation that provides flexibility in layout and reduces costs. Both systems are robustly designed utilizing barriers based on proven engineering and world wide accepted treatment solutions. Included with supply is a high level of redundancy by designing for operating and maintenance flexibility. 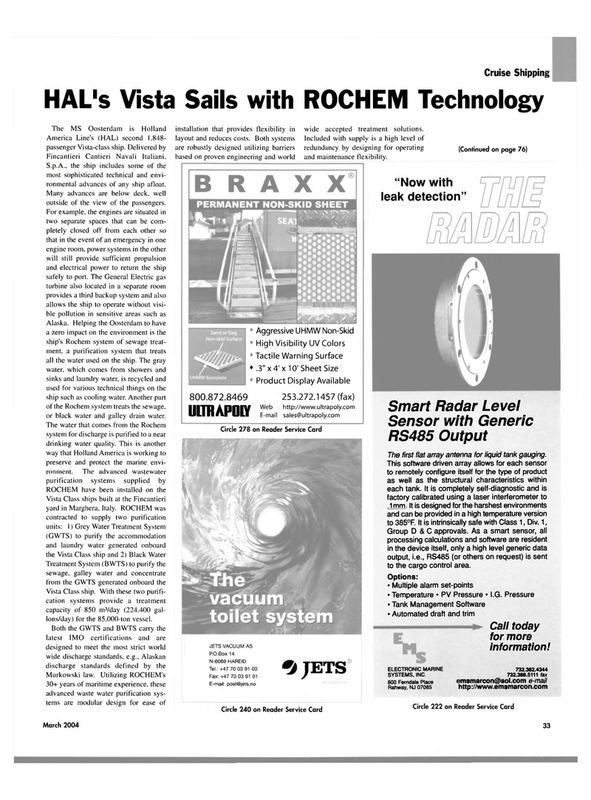 (Continued on page 76) "Now with leak detection"
The first flat array antenna for liquid tank gauging. Group D & C approvals. As a smart sensor, all processing calculations and software are resident in the device itself, only a high level generic data output, i.e., RS485 (or others on request) is sent to the cargo control area.